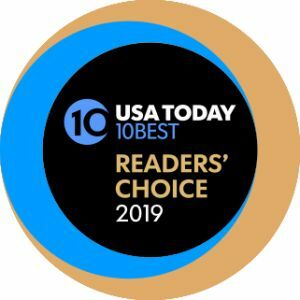 You can help us promote the spectacular Vallarta Botanical Garden AND Puerto Vallarta by Clicking HERE to vote for the VBG on USA Today's list of the '10 Best Best Botanical Gardens in North America' for 2019. Puerto Vallarta, Jalisco, Mexico - For the second year in a row, our beautiful Vallarta Botanical Garden (VBG) has been nominated by a panel of experts to compete against 20 of the best public gardens and arboretums in North America for a spot on USA Today's '10 Best' list for 2019. Known as THE place to go for trusted travel advice, 10Best.com provides users with original, unbiased, and experiential travel content of top attractions, things to see and do, and restaurants for top destinations in the U.S. and around the world. Anchored by USA Today's award-winning travel website, it encompasses themed lists that explore fun and inspiring getaways, attractions, events and special holiday spots. In this case, they are searching for the 10 best public and botanical gardens on the continent, and, once again, VBG is the only Botanical Garden in Mexico to have been nominated. To be eligible, all of the gardens must help to promote and conserve the plant diversity of our planet, while showcasing their vast collections in stunning, visitor friendly ways. The VBG also boasts four conservatories showcasing local and exotic flowers from all over the world, plus vanilla, chocolate and coffee plantations; a museum; a rock collection; and a large population of hummingbirds, Military Macaws, and many other species of wild birds. The VBG also hosts a variety of family-friendly community events that aim to educate Puerto Vallarta residents and visitors on the importance of environmental stewardship and appreciation for our natural wonders. As the Banderas Bay region's most popular living museum, last year, adoring fans voted the VBG into 4th place in USA Today's '10 Best Botanical Gardens in North American' contest, but this year, we are going for The Gold! You can help us promote the spectacular Garden in beautiful Puerto Vallarta, Mexico, by Clicking HERE to vote for Vallarta Botanical Garden on USA Today's '10 Best Gardens in North America' list for 2019. Votes may be submitted once a day, every day, until the polls close on Monday, April 22 at noon ET. The winners, chosen by you, will be announced on Friday, May 3. Visit the internationally famous Vallarta Botanical Garden located just 30 minutes south of Old Town at Km. 24 on Highway 200 and easily accessible by public transportation and taxi. This 64 acre wildlife preserve and botanical garden have something fun for everyone. Over 200 species of birds have been observed on the Garden's grounds. Don't forget to bring your swimsuit for a refreshing dip in the jungle river. See plantings of vanilla, chocolate, and hundreds of other botanical delights! Authentic Mexican Cuisine is served in the Hacienda de Oro Restaurant from 10 am to 5 pm. The Garden is open daily from 9 am to 6 pm (closed Mondays from April 1 to December 1). Garden admission is just $200 pesos. For more information, call (322) 223-6182 or visit vbgardens.org. Click HERE to learn more about Vallarta Botanical Gardens.